Los Angeles, CA (July 2008) – Walt Disney Signature, Disney's first upscale, non-character lifestyle brand, marries whimsical design elements with sophisticated styling in its growing collection of product offerings. 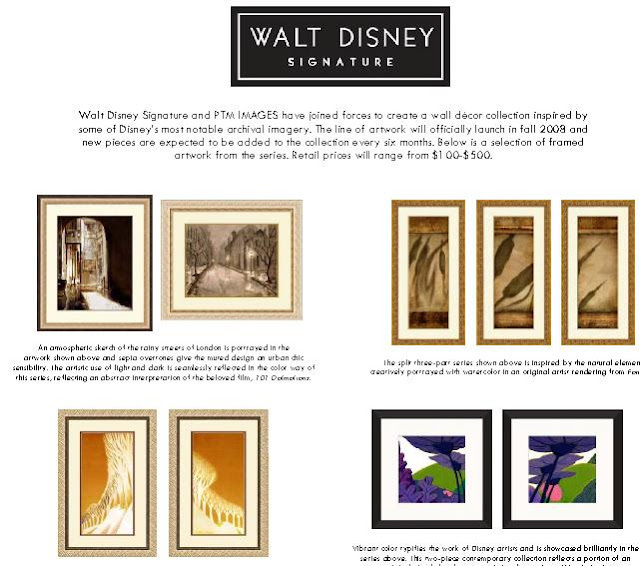 This month, Disney Consumer Products is proud to announce the launch of Walt Disney Signature wall décor with established framed graphics manufacturer PTM IMAGES. The new collection of over 150 pieces of framed wall art takes inspiration from the original artistic sketches of classic Disney films. Inspired by Walt Disney himself and the furnishings in his office in Burbank, California, the Walt Disney Signature line was launched with a 12-piece furniture collection by Drexel Heritage in 2006. Following the success of the first collection, the Walt Disney Signature collection has continued to expand by introducing a rug collection with The Rug Market, a lighting collection with Minka and most recently, a tabletop collection with Zak! Designs. .PDF Fact Sheet with Pictures - Click Here to see it on my Scribd page! Disney Consumer Products and PTM IMAGES have brought some of the most notable Disney archival imagery to an adult audience through chic, interpretive Walt Disney Signature wall décor. "The Walt Disney Signature brand collaboration with PTM IMAGES celebrates the archival art from classic films that has been so vital to the success of the Disney brand," says Robert Oberschelp, Director of Licensing for the Walt Disney Signature collection. "This collection of interpretive wall décor allows consumers to bring the inspiration behind some of Disney's most beloved films into their own homes." PTM IMAGES President, Jonathan Bass adds, "We are elated to create such a memorable collection around some of Disney's most renowned artists and animators. We believe this relationship will successfully bring together the best of historical art and modern design." PTM IMAGES is a leading wholesale supplier of framed graphics. Founded in 1995, the company provides framed graphics, on a large-scale basis, to retailers across the U.S. PTM stays on top of trends in the art world and brings high quality gallery-like products at product pricing that meets the demands of retailers nationwide. PTM IMAGES consistently provides product development and trend direction with an expansive offering of exclusive framed graphics available to meet the everchanging demands for the latest décor styles. PTM IMAGES develops products utilizing all themes and styles, from contemporary to traditional. For more information visit www.ptmimages.com.